The second weekend of September has turned into a massive weekend of racing over the last few years and there was an array of TriPurbeck and TriPurbeck related athletes racing in multiple venues. Juniors first and Sam Brown smashed the Poole Park 5k in 16.40 on Saturday before Lily Burnet produced an excellent 2nd place overall (out of 58 females) in the Dorney Lake super sprint on Sunday – very impressive. She completed the 400m in 6.51, 10.6k bike in 21.18 and ran 2.5k in 12.08 – Lily goes from strength to strength. The ETU Long Distance Championships came to Weymouth on Sunday and Johnathan Foot and friends of TriPurbeck, Clodie and Stephen Sutcliffe and Isobel Ross were in action in the half distance race. Johnathan certainly had a good race although we’re still slightly unclear as to where he finished as the results have him in first for the 60-64 category in but with a 59min run for the half marathon – which would be fairly sharp even for Johnathan given that Mo Farrah was busy winning the Great North Run in 59.22….. hold on a minute…. Clodie Sutcliffe produced a great 5hr22min finish to take 3rd in the 45-49 category and Isobel raced brilliantly to post a 5hr32min time in her first half. So this is much documented now but if you are going to enter an Ironman that’s a fairly big challenge. 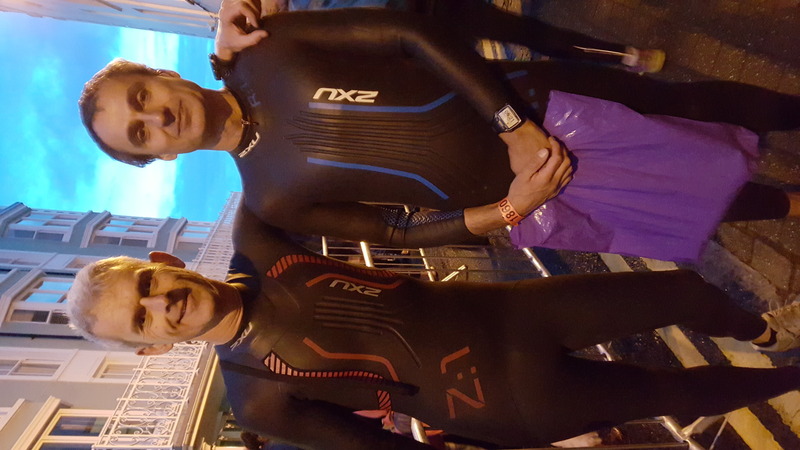 Not sufficient for Gary Sawtell and Simon Carvisiglia though, as they went for Wales – arguably the toughest Ironman course in the world and Mark Julier was back for a second year in a row. Still, he decided to ramp up the challenge a notch by pitching up anyway despite breaking his pelvis in May. Crazy man. Friend of TriPurbeck Jim Evans was also there hunting down a Kona slot in the 45-49 category and Charlie Craven (part of TriPurbeck’s London branch) was also on the start line. So, on to the main event. No not the triathlon. Both Gary and Simon were making an attempt on the World Transition record, a prestigious title for the athlete who is able to pfaff for the longest between the swim and bike and then bike and run. Fran, an amateur in this category, posted a decent 16min total time in Wales a couple of years ago as an early marker but she is no match for these boys. Admittedly Wales does include a 1km run up from the beach making it the ideal venue for this record attempt but Gary made full use of it posting a magnificent 18min13sec for the swim-bike alone. Not good enough though as Simon racked up a seemingly invincible 19.16 for the first transition and followed that up with 9.36 after the bike to put down a 28min52sec total, clearly all the training had paid off. You’d have thought. But Sawtell was in no mood for second place. Rumours that he rolled his legs and nipped out for a swift half were quashed by the officials who pointed out it wasn’t against the rules anyway as he romped to victory with a 13.23 second transition and a grand total of…. wait for it….. 31min36sec in transition. As the Ethiopian celebrated, Carvisiglia was left to rue not including the extra pair of socks, tea break and phone call to his insurance company but vowed to return next year after a bit of a pfaff. Anyway back to the real racing. Gary put the swim at Wimbleball behind him with a great 1hr28min first discipline and Simon matched him for pace on the first lap but very unfortunately felt a tweak in his calf as he ran along the beach before starting his second. The injury slowed him down a bit on the swim but in a very respectable 1.36 he headed up to the transition. Charlie had an excellent 1hr20min swim in the 50-54 category and a phenomenal 21min58sec transition making even the new world record holder look a bit nippy. Mark and Jim were already out on their bike having swum 1.06 and 1.07 respectively and they were never more then a few minutes apart for the entire bike ride with Mark heading out on the run 3mins ahead. Gary eased into the very challenging bike, riding really well to post a sub 7hr bike split – maybe helped by a few alpine hills earlier in the season – and looked great heading out on the run…….eventually. Simon’s excellent 7hr25min bike split was again testament to some hard work in training but the run would provide the biggest challenge as his earlier calf issue started to give him trouble. He worked through it brilliantly though despite a couple of bad patches and finished in 14hr22min – a massive achievement on that course. Charlie’s 8hr bike ride and lightning fast second transition meant that a 5hr run would secure a 15hr finish but no transition glory for the big man. Gary appeared to smile his way round the whole run for an absolutely superb 13hr02min finish in his first iron distance event – great stuff. Meanwhile, Mark, despite the pelvis, and largely due to a 6hr03min bike split broke the 12hr mark with an 11.47 time and Jim agonisingly missed out on a Kona slot by just 3min after a brilliant 3hr36min marathon for a total time of just outside 11hr. oh dear, i hadnt realised i was in contention for a world championship transition time. the London branch is slacking, shouldnt have had that second cup of tea !